On Monday morning, the CBO announced in its latest forecast that, as widely expected, U.S. budget deficits are set to widen further in coming years and economic gains will be muted" - a growth outlook that’s weaker than the Trump administration’s target of at least 3 percent growth. However, the surprise was that contrary to the CBO's last forecast, the budget deficit is now expected to hit $1 trillion two years later than previously projected. Specifically, the U.S. budget deficit is forecast to widen to "only" $897 billion over the 12 months through September, from $779 billion last year. This means that contrary to the CBO's last forecast in April, the U.S. budget deficit will top $1 trillion in fiscal 2022. The CBO estimated in April that the budget deficit for the entire fiscal year would increase to $804 billion, before widening to $981 billion in fiscal 2019 and topping $1 trillion in 2020. “That reduction in projected deficits results primarily from legislative changes -- most notably a decrease in emergency spending,” the CBO said, somewhat optimistically especially since the economy is forecast to slow over the next three years with the growth rate easing to 2.3% in 2019, 1.7% next year, and 1.6% in 2021, the CBO forecasted; growth was an estimated 3.1% last year. “The slowdown begins in 2019 as the positive effects of recent tax legislation on business investment are expected to wane and federal purchases under current law are projected to drop sharply starting in the fourth quarter of this year,” according to the report. There is one problem with this forecast: Wall Street disagrees vehemently, and according to analyst forecasts, the Treasury Department will see further acceleration in sales of long-term debt to finance the government’s widening budget deficit, with new issuance projected to top $1 trillion for a second-straight year. As Bloomberg notes, many strategists at primary-dealer firms predict that this Wednesday’s quarterly refunding announcement will see the Treasury maintain note and bond sales at the record high levels they have boost. “We’ve seen deficits continue to blow out,” said Brian Edmonds, head of interest-rates trading at Cantor Fitzgerald in New York. “We are going to see more and more supply.” Cantor, along with dealers including Citigroup Inc., TD Securities, Deutsche Bank AG and Wells Fargo Securities, sees the Treasury keeping auction sizes unchanged for nominal coupon-bearing debt. According to one specific forecast, that of Steven Zeng from Deutsche Bank, the Treasury’s total net new issuance in 2018 amounted to $1.34 trillion, more than double the 2017 level of about $550 billion. In 2019, it will be $1.4 trillion, with $1.11 trillion from more coupon-bearing debt and the rest in bills. Since February 2018, the Treasury has increased auction sizes for coupon securities at each quarterly refunding meeting, boosting gross public issuance by $341bn to $2,388bn last year. Net issuance climbed from $419bn in 2017 to $942bn in 2018, and we estimate it will rise further to $1,111bn in 2019. The increased Treasury issuance follows tax cuts and government spending increases implemented under the Trump administration, and, as Bloomberg notes, "that’s darkening a fiscal outlook already made worrisome by rising entitlement-program expenses and higher costs to service America’s nearly $16 trillion in debt. Meanwhile, the Federal Reserve’s balance-sheet runoff is also adding to supply, forcing the Treasury to reach out to the public for even more funding. 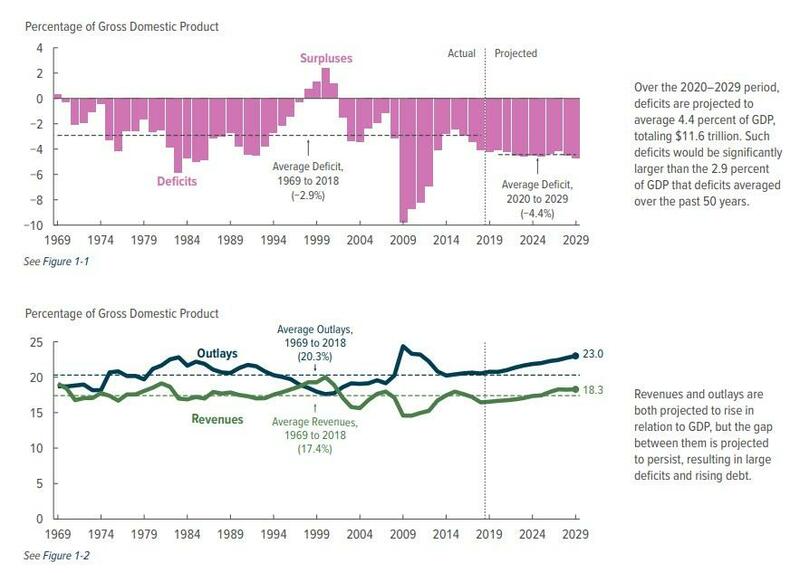 Of course, there is no change to the CBO's long-term forecast of debt issuance which is, basically, apocalyptic as the following chart confirms. Curiously despite the flood of supply, Treasury yields haven’t surged higher because demand hasn’t dropped for the world’s safest securities, as confirmed by the just concluded very strong 2Y auction. Yet investors aren’t so sanguine, most notably DoubleLine Capital LP’s Jeffrey Gundlach who has repeatedly warned that the U.S. economy will be plagued by an ocean of debt. 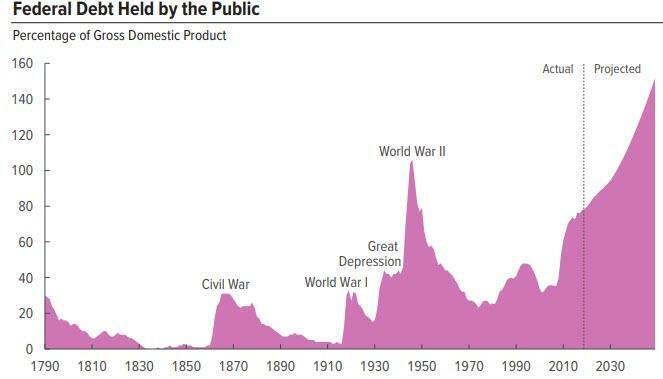 He cited the fiscal 2018 rise in America’s national debt among risks in his annual webcast, and just overnight tweeted that currently the US has "$122 Trillion US unfunded liabilities per Debtclock. That’s 564% of Fiscal ‘18 GDP. To fund would require 10% of GDP for 56+ yrs." Billionaire investor Seth A. Klarman, in a letter presented at the World Economic Forum in Davos, Switzerland, said global social tension, receding American leadership and rising debt levels all present a red flag. Yet while it is a virtual certainty that the CBO is wrong, and that US deficits will continue to soar as the US is forced to issue over $1 trillion in net debt each year, the wildcard is whether the Fed will slow down is balance sheet tapering. 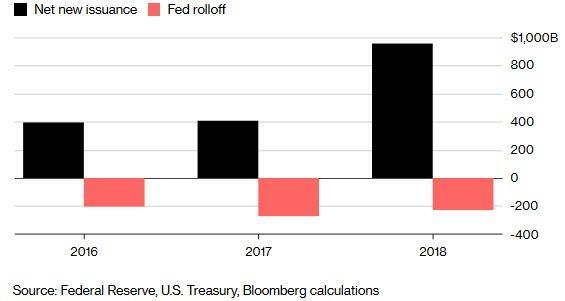 Last year, the Fed’s Treasury holdings fell by about $230 billion in 2018, compared with a reduction of $18 billion in 2017. An additional $271 billion should roll off this year, according to JPM, and the Treasury will have to find an offsetting amount of demand for this paper.